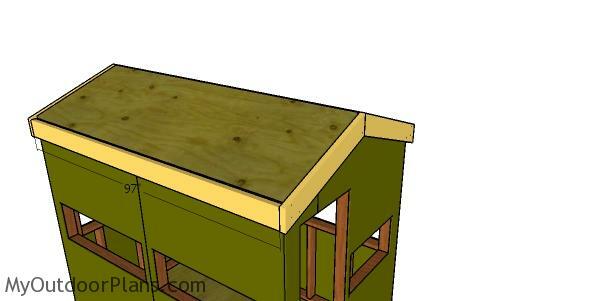 This step by step diy woodworking project is about 5×6 deer stand roof plans. 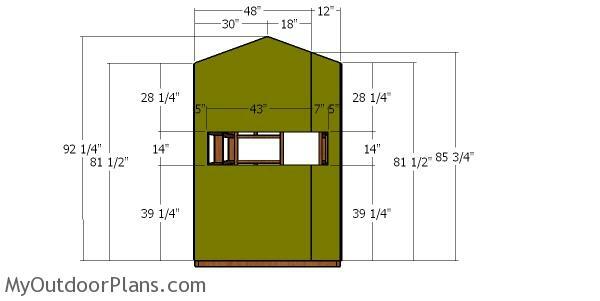 This is PART 2 of the deer stand project, where I show you how to build the gable roof. 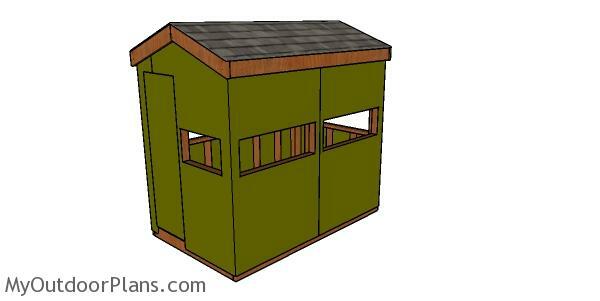 This gable roof for the deer blind is sturdy and super easy to build. Make sure you take a look over the rest of plans to see alternatives and more projects for your garden. The first step of the project is to build the rafters for the deer stand from 2×4 lumber. Use a saw to make the cuts to the rafters, as shown in the plans. Smooth the edges with sandpaper. Fit the rafters to the top of the deer stand. 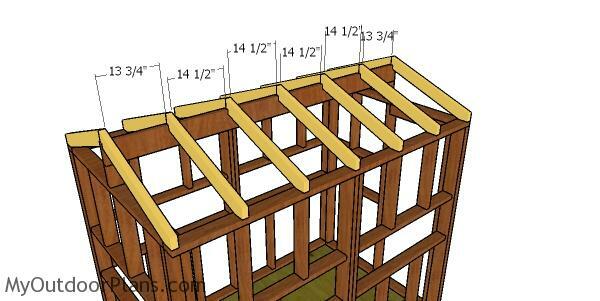 Place the rafters every 16″ on center and then lock them into place with screws. The next step of the shooting house is to attach the 1/2″ plywood panels to the side walls. As you can notice in the diagram, you need to make a few cut outs for the windows. Smooth the edges with sandpaper. Attach the panels to the frames and align the edges with attention. 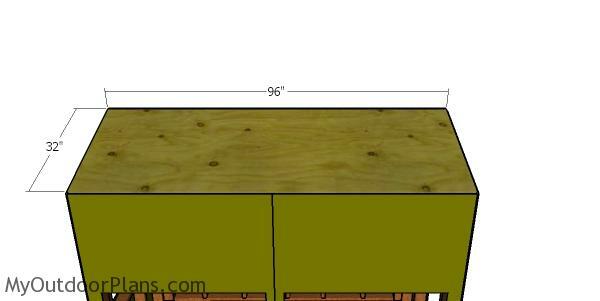 Insert 1 5/8″ screws to secure the panels to the framing, every 8″ along the studs and plates. 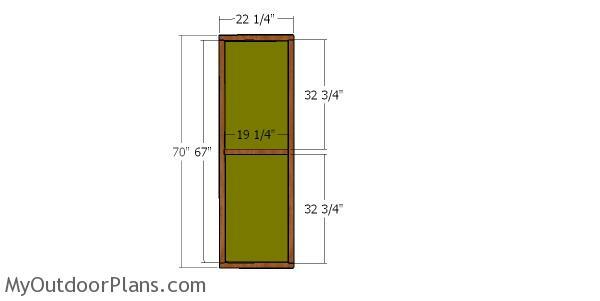 Cut the 1/2″ plywood panels that go on the front wall of the deer stand. 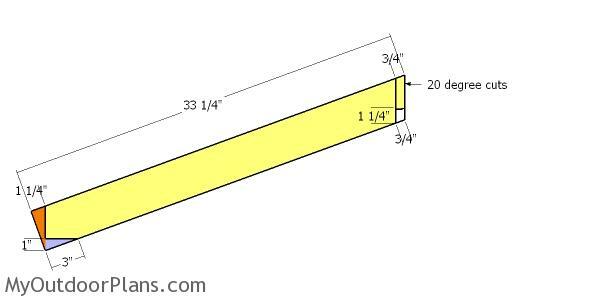 Make the cuts as shown in the plans and then secure them into place with 1 5/8″ screws, every 8″ along the framing. Cut the panels for the back wall and then secure them into place. 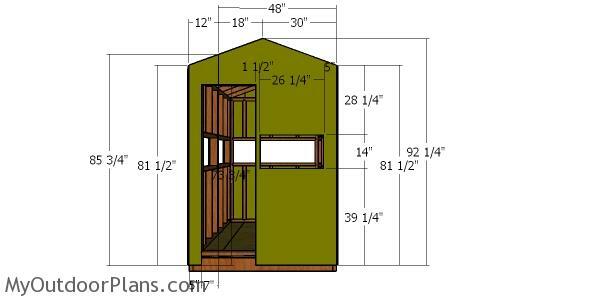 Build the roof of the deer stand from 3/4″ plywood. Cut the sheets at the right dimensions and center them to the rafters. Use 1 5/8″ screws to secure the sheets into place, every 8″. Cut and fit the 2×4 trims to the front and back of the deer stand. Use 3 1/2″ screws to lock the trims into place tightly. Fit the 2×4 trims to the sides of the deer stand. Align the edges and use a spirit level to make sure the trims are horizontal. Drill pilot holes and insert 3 1/2″ screws. Cover the roof with tar paper. Use staples to secure the tar paper into place. 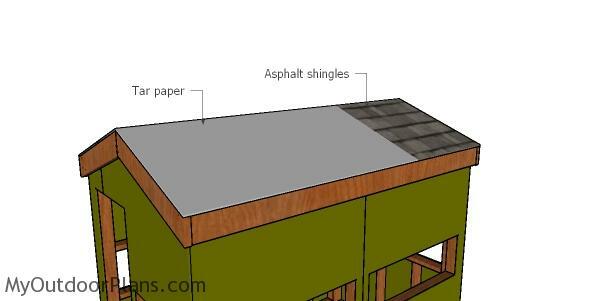 Next, you should install asphalt shingles to the roof, starting from the bottom up to the top. Install a ridge cap to waterproof everything in a professional manner. 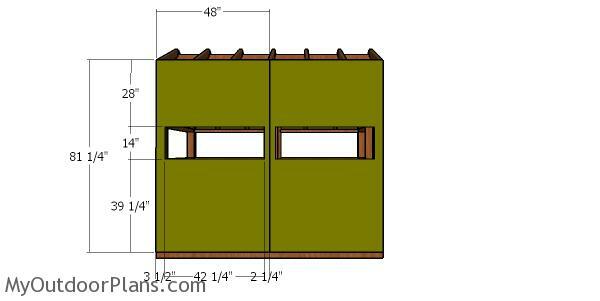 Build the door from 2×2 lumber and 1/2″ plywood. 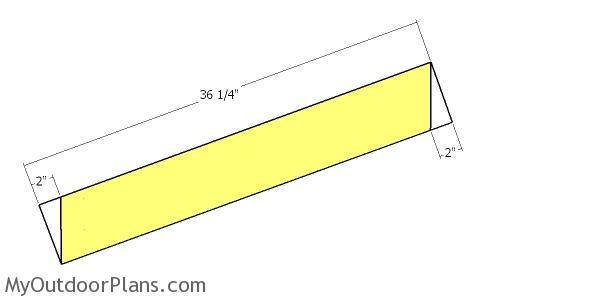 Cut the plywood panel at 22 1/4″x70″ or you can use the piece that has been cut out when building the back wall. Attach 2×2 trims to the panel, as shown in the diagram. 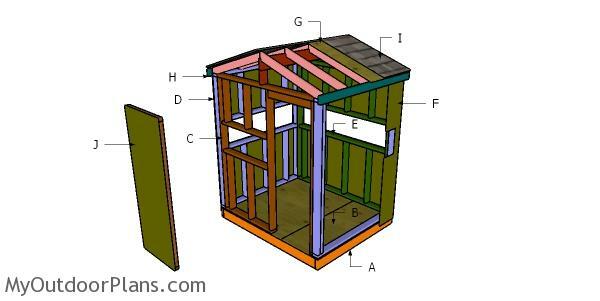 Use 2 1/2″ screws to assemble the frame. Use 1 5/8″ to lock the frame to the panel. Fit the door to the opening and lock it to the wall with hinges. Install a latch to keep it tightly closed. Now that you have assembled everything with attention, we recommend you to cover the exterior components with a few coats of paint. 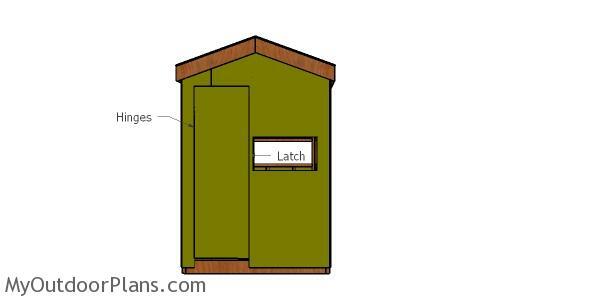 Top Tip: Make sure you check out PART 1 of this project, to learn more about how to build the frame of the elevated deer box. 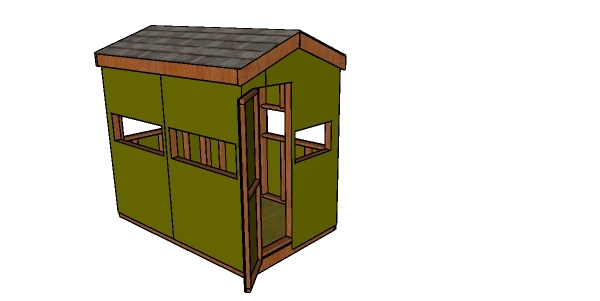 This woodworking project was about 5×8 deer stand gable roof plans. If you want to see more outdoor plans, check out the rest of our step by step projects and follow the instructions to obtain a professional result.